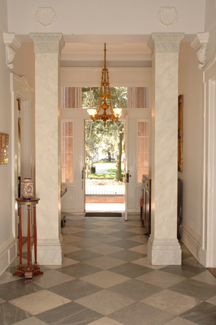 Classic architectural design can be seen in this Savannah home, which is open for tours. This handsome Greek Revival mansion, built in 1842, is beautifully furnished with antiques, yet retains the feel of a real home. 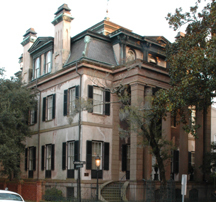 The house was constructed using Savannah grey brick stuccoed and scored to resemble large blocks of stone, this was a common practice in Savannah during the 19th century and thought to have been designed by Charles B. Cluskey. The first and second floors are separated in elevation by a belt course of stone and the parapet detail was done in stone. 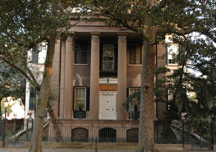 The west face of the building has a two story porch with a roof supported by columns, leading to the entrance of the building, called a portico. 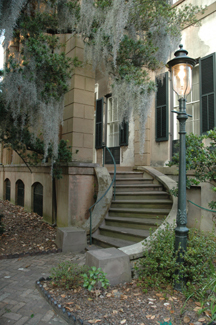 The exterior portico corners of the Harper Fowlkes House are defined by square columns, while the central portion is supported by four grand Corinthian columns. The second empire details of the third floor were executed in copper, and slate was used as roofing material. The entry level is reached by symmetrical curving stairs. Dormer Windows are above the portico. The chimney to the right of the dormer, is one of six chimneys which provide 12 fireplaces throughout the house. You will discover the first floor windows are six over nine with lower three lights shuttered separately. Look for the six window lights and panes, nine window lights/panes with six visible and three shuttered and separate shutters covering three window lights/panes. 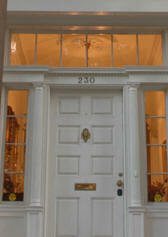 The front door is of the Greek Revival style with sidelights and a transom. The entrance opens to a large central hall with Georgia marble floors, and pair of columns. Inside: Don’t miss the large double parlor with marble consoles and gilded mirrors at each end, original to the house. To the right is a sitting room and large dining room, warmed by the original faux bois, or graining detail, on the plaster walls. The mansard roof features one-over-one arched windows with a cupola, which provides a lookout and admits light and air. 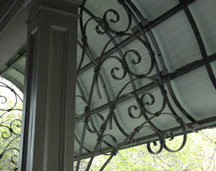 The first floor porch roof is supported by four square Doric columns in a vernacular form.